Ming & Ping are an Asian American electronic pop band from Los Angeles, California. The group consists of Hong Kong born identical twin brothers Ming and Ping (last names unknown) and their producer/creative director Bao Vo. The band was formed in 2002 in San Francisco, California and released their first full-length album in 2004 entitled mingping.com with Chicago-based indie record label Omega Point Records. The brothers have stated in numerous interviews that they are heavily influenced by 80s new wave bands such as Pet Shop Boys and New Order, and their 2007 album Causeway Army appeared in XLR8R magazine's March 2008 top ten, where it was described as "full of high-energy electro pop that works just as well in a Prada boutique as it would a gritty nightclub in London." Ming & Ping has gained a following largely from their songs appearing in snowboarding films and other sports film, television, and promotional spots from major companies like Bombardier Ski-Doo, Transworld Snowboarding, Oakley, Alliance Wakeboard, Mack Dawg Productions (MDP), among others. The group is also known for their visual art, costumes, and theatrical live performances that are primarily directed by artist Bao Vo, whose collaboration with other artists has yielded a large portfolio of photography, illustrations, videos, and costumes that is uncommon for independent musical acts. 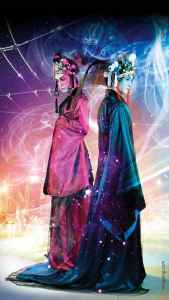 Vo is also responsible for assembling the brothers as a musical act and the supporting cast for their Cantonese Opera inspired live performances known as "The Ming & Ping Dynasty." These performances have been exhibited on tour with Freezepop and with groups such as Major Lazer, West Indian Girl, and Ultraviolet Sound. How to Destroy Angels vocalist and Trent Reznor collaborator Mariqueen Maandig Reznor has appeared as a guest vocalist on two Ming & Ping songs, "Mixed Melodies" from their eponymous 2009 album and "Chinatown" from 2012's The Darkness of Night. Interest in the group is aided by rumors that both twins are in fact the same performer. However, due to their rare public appearances, these rumors remain unconfirmed.